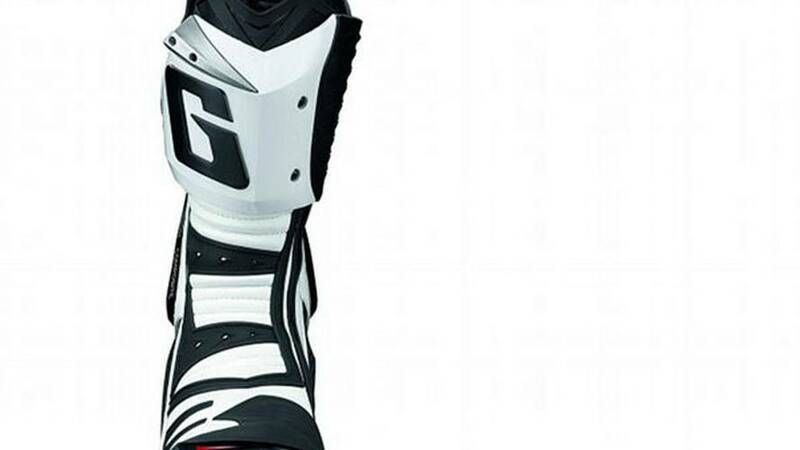 You might be familiar with Italian boot maker Gaerne’s range of motocross boots, but this new GP-1 in intended to put them on the road racing map too. 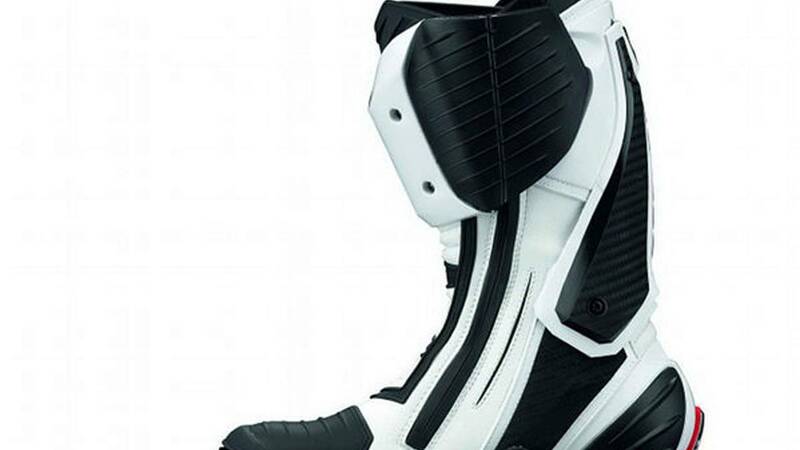 A high-end racing boot targeted at the likes of the Alpinestars Supertech R, the Gaerne GP-1 attempts to differentiate itself with a very slim profile, good looks and easily replaceable components. Like other fancy road race boots, the GP-1 sets out to protect against two types of injuries — impact and hyperflexion or hyperextension of the ankle. It achieves the former with the usual array of polyurethane heel cups, shin and toe protectors, plus shock absorbing materials in the heel and sole. Impact protection over the ankle and side of the leg is achieved through a large carbon composite plate on each side of the boot which also form the Gaerne Floating System, which prevents extreme front-to-rear or side-to-side movement of the ankle while allowing for the normal range of movement. To do that, those carbon plates slide within slots on the boot’s chassis. When the slots run out of space to allow motion, the boot stops flexing. One of the visual features which first attracted us to the boots was the novel toe slider solution. Rather than a bulky gob of plastic held on with a slide release or similar, the Gaerne’s come with a thin magnesium bar which runs around the corner of the foot, slotting into the toe of the boot and attaching securely by a screw mounted to the rear and out of the usual abrasion zone. It’s an attractive solution that looks less like the boot’s grown a case of plastic elephantiasis and more like the strong mechanical element it is. There’s also magnesium sliders on the heels which attach with screws while the entire plastic shin guard and silver-colored nylon slider there also detach and are replaceable. Those sliders combine with the carbon composite ankle plates and restrained use of red cushioning material peaking out from slots in the toe and heel to lend the GP-1 a strong air of mechanical function. They look like futuristic ski boots or robot feet more than they do regular footwear, something that’s accentuated by other components like the carbon ratchet used to adjust the boot’s fit and the ventilated rubber gaitor at the top. We also like the looks of the textured rubber pads over the shifter area and on the inside of the heels and calf. These should help make shifting more positive while providing some extra grip between the boot and bike while hanging off. If you remember Sean’s How to Get Your Knee Down article, gripping the bike with your outside knee and leg while hanging off helps move weight off your inside toe, allowing greater freedom of movement. The zipper is also enclosed in a rubber guard, highlighting a level of detail attention which is pretty exciting. Gaerne USA is listing the GP-1 at a fairly shocking $500 for the regular version and $530 for the perforated Gaerne GP-1 Air. That’s quite a bit more than the ubiquitous $450 Alpinestars Supertech R or the $430 Dainese Torque Pros or the $500 Sidi Vortice Vernices, but it appears that this is a case of MSRP not representing retail reality. RevZilla, for instance, is advertising a $405 price.